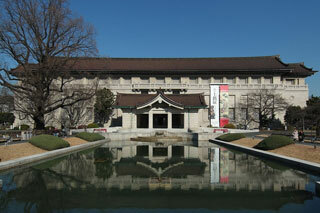 The Tokyo National Museum, or TNM, established in 1872, is the oldest Japanese national museum, the largest art museum in Japan and one of the largest art museums in the world. The museum collects, houses, and preserves a comprehensive collection of art works and archaeological objects of Asia, focusing on Japan. The museum holds over 110,000 objects, which includes 87 Japanese National Treasure holdings and 610 Important Cultural Property holdings (as of July 2005). The museum also conducts research and organizes educational events related to its collection. This article uses material from the Wikipedia article "Tokyo National Museum", which is released under the Creative Commons Attribution-Share-Alike 3.0 License.